The answer is that self-actualization has everything to do with business because business is what people do and it is what people do through people. So the quality of the people, the level of motivation at which they live, their intentions in their visions and missions, the values the company expresses, the culture that governs the organization —all of these are reflections of the development level of the people involved. And therefore the development level of the company. 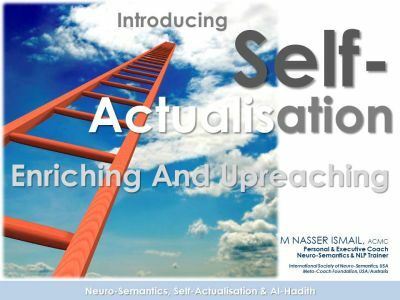 Because self-actualization refers to people being at their best, unleashing their potentials, fulfilling what is richly meaningful, contributing being-values (order, beauty, excellence, goodness, quality, etc.) businesses thrive when leaders, managers, and employees are self-actualizing people. And conversely, when you have the opposite— fearful, rigid, non-creative, self-absorbed, self-serving leaders, managers, and people—business will suffer. These are the things that make business a jungle. There will be unethical competition, lying, cheating, stealing, and every other thing that makes business ugly. And that sabotage the business. These are the things that cause businesses to go bankrupt and CEO to be handcuffed and led off to prison. The quality of business depends on the quality of people. The quality of the products and services we create in our businesses depends on the quality of the leaders, managers, and employees. And that’s why it begins with self-actualizing leaders who set a vision for a more human and humane organization. It begins with self-actualizing leaders who begin with the right psychology— Self-Actualization Psychology. When we get our psychology right, then we can make leadership and management right. Maslow argued for this 70 years ago and McGregor put it into the language of Theory X and Theory Y of management. And while you may think that this is “old stuff,” it is only in terms of what we know. But in terms of practice— it is absolutely new and revolutionary! That’s because to effectively lead and work with people we have to know what drives them and how they effectively gratify those drives. In Neuro-Semantics, that’s where we have extended Maslow’s hierarchy of needs in our Matrix Embedded Volcano. What does that mean? It means that we humans do not merely have drives that motivate us, but our driving needs are informed by the meanings that we create about those impulses. That’s why every single one of us have different experiences with the same driving needs within us. It all depends on how you think about, represent, belief, frame, decide, etc. about your needs. How you frame (or meta-state) your needs and what you understand about gratifying them transform them into healthy motivational energy or neurotic motivational energies. This is what Neuro-Semantic NLP uniquely offers to leadership and business development today. Now you can discover why and how any person can distort his or her drives and end up psycho-eating, psycho-spending, psycho-sexing, psycho-securing, psycho-approval-seeking, etc. And when that happens, the need has you. The need distorts life. And the pseudo-coping skills cause you to become stuck at that level of need and unable to move up to the self-actualization needs. Businesses work best when people are actualizing their highest meanings and values and making real their best potentials. Companies need people who are able to tap their human capital of intelligence and creativity. They need people living above the Jungle Needs (the first four levels of the hierarchy of needs)— people who live in the highest self-actualization needs. Firms need leaders who can lead people to new visions of possibilities, managers who can empower and coach people to bring out their best, and people who enjoy fully engaging their best efforts in creating valuable products and services. Such companies are self-actualizing companies. The inescapable fact is this: People at work in every role are still human beings. We don’t leave our humanness when we enter the front door of the office or the factory. Inside the business people are still driven by their needs and those needs are informed by their meanings and understandings. And the level at which they live and work determine the quality of their lives as well the health or sickness they bring to all their actions and relationships. Does a person live at the survival level? Then that person probably won’t attend to safety concerns. Does a person feel unsafe and need security? Then that person will not likely to give much energy to how he or she treats others and feels connected. Does a person live at the social need level (love and affection)? Then that person will be unlikely to treat himself with dignity and worth. It is only the person living at the level of the self-actualization drives and needs that’s able to get the ego out of the way and effectively contribute without being self-absorbed. It is only when a firm has self-actualizing leaders and employees that people get beyond the deficiency needs that a firm can be organized in a way that makes the culture human.